There is something about building a Sukkah that opens the door to who we are. Our Sukkah building reveals the blueprints to our mind, our heart and our soul. 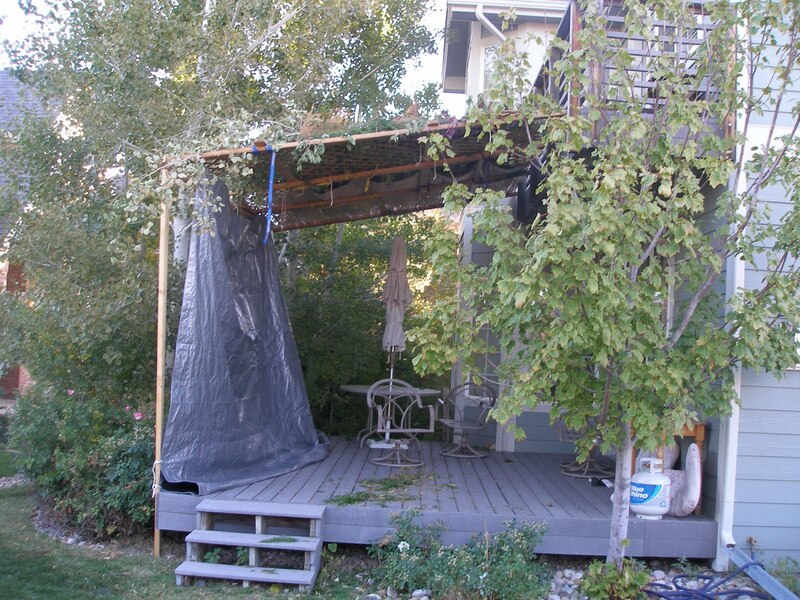 Some people spend a great deal of money buying pre-fab Sukkot. They look at the directions and fit piece A into slot B. They put up the pre-painted fabric walls. Lastly they roll out the pre-fab Schach סכך (I so love that word), the vegetation that is the roof of our temporary dwelling. Voila, the Sukkah is complete. Every year when I wobble on the ladder, slam my thumb with the hammer and curse the stripped screw heads, I vow that next year I will buy a beautiful pre-fab Sukkah and make life easy on myself. But somehow, it does not ever seem to happen. I like building my own. Sometimes my soul-partner helps and my daughter and son. It is a family enterprise and that adds meaning to an already meaningful connection. Building a Sukkah is a Mitzvah מצווה and Mitzvah means connection. Building a Sukkah is all about connections. My friend Jon, who is a lot smarter than I am comes over to help. He has a tool box and a tape measure and apron for holding nails and screws and things. He sits with me to plan out the Sukkah. He plans, making notes and drawing designs. He writes down the material that I have to buy or he will donate the twine and screws and this year the webbing that he suggested is more eco-friendly and reusable. And then we set to work. Jon wants to put it together according to the plan, with strong clean lines that will create a beautiful and secure structure. I want to slap it together. After all, it only has to stay up for 8 days. He holds his heart and groans as I secure the beams haphazardly, rather than evenly. Each year I tell him the same story of my childhood Sukkah. Each year he has to teach me the names of the different roles that the 2x4s and 1x4s play. There are studs and rafters and beams and other things that I have already forgotten. I ask “why?” a lot. Because of the work and the family and the friends and the Mitzvah מצווה, Sukkot has been elevated on my hit parade of holidays. For Jon we are building a dwelling, albeit a temporary one. The Sukkah is a dwelling place. It is a dwelling place for G. WAIT! Don’t dismiss that phrase. It is a dwelling place for G. We have always built incredible edifices in hopes of bringing that deep power, that Sacred Other into dwelling. We have built Temples and Synagogues and Shuls, all to hold the Shehina . Jon, whether in his consciousness or deeper, is building G’s house and he wants to “do it right”. What a wonderful soul challenge. If you were G’s contractor, what would you build? Would you build a citadel or summit, mansion or meeting hall? How would you build something that is inviting to G.? For some it might be a palace of ritual. By following ritual we can open ourselves to G’s dwelling, G’s Shehina. For other people an inviting dwelling place would be a Yeshiva where Torah is studied, Jewish issues discussed. Some would want a humble dwelling, shining with righteous action, fairness, compassion. For my part, we are building a ‘tree-house’. I put up a Sukkah like I am a kid building his first tree-house. I want to build a tree house for G. I want to climb to my tree house on steps that mystically support my weight forcing me to concentrate and shed my baggage. I want to call out, in hallowed whisper, the secret password shared by all who also share deep philosophical questions of balance in the tree house. I want to climb and jump and laugh and learn the lessons of the tree house. There are great lessons to be learned in the tree house, in the Sukkah too. They are the lessons taught by creatively understanding Halacha and history and the meaning of mystery. They are a hidden discussion with our souls and our soul-maker. They are coaching tips for us in regards to our interactions with each other and with ourselves. 3. Check how many walls you have put up. What do we want to keep in and what do we want to keep out. How big is our welcome mat and is it a heartfelt welcome mat. 4. Eat in the Sukkah. Food tastes better when shared with good friends and enlightened ancestors. 6. Every once in a while you might have to prop something up. We need continually to examine our structures, the ones we build with our hand and the ones we build with our hearts. 7. Stop! Look up at the stars. That twinkling through the branches is there for a reason. Connect the dots. 8. Look at the shadows at your feet; let your imagination off leash. What do you see? 9. Always invite guests. It is merry and meaningful. Remember to invite the spirit guests, those who have built Sukkot before you. They are our inner teachers. 10. Putting it together yourself, with a friend is fun and it is fulfillng. It is heartful, soulful, full. My family and friends come over. We build a Sukkah, a palace, a playhouse. And we laugh, and G gets a good dwelling place and a good ride. I pray that all our Hagim are filled with laughter, love and meaning.